Each player is the director of an expedition intent on exploring Tikal in search of the secret paths that lead to the temples and precious treasures that have remained hidden for over 1000 years. A player receives points during four scoring rounds for each recovered treasure and for each temple that he controls. But, both temples and treasures can change hands. The expedition that earns the most points exploring Tikal wins the game. "Germany’s Game of the Year is a brilliant production that fits its theme extraordinarily well." 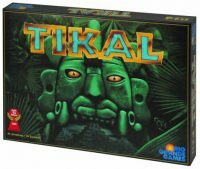 Add a Review for "Tikal"